The Buch der heilgen Dreifaltigkeit is a complex document, part a work of historical prophecy and part an alchemical text. The core of its alchemical message lies in drawing a parallel between the Christian idea of the redemption and the alchemical process. We have seen something of this in our discussion of the two hermaphrodites - the Luciferic and the alchemical. 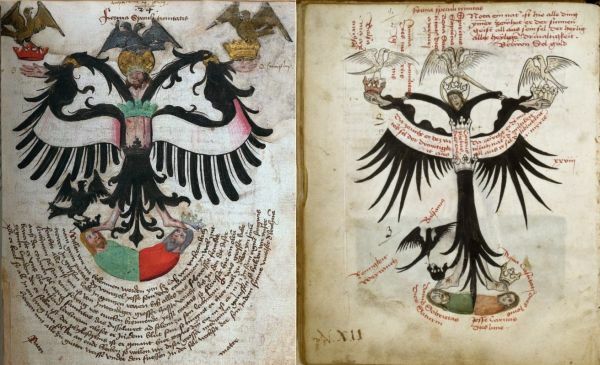 There is a particular image in the Buch der heilgen Dreifaltigkeit, that of the Crucified Christ Eagle, which explains the ideas underlying the alchemical message in the manuscript. I show here the versions in the Munich and the John Rylands manuscripts. Here we see a two headed black winged eagle set on top or conjoined with the image of Christ crucified. Christ here bears the crown of thorns beneath his golden crown and we see the stigmata on his hands and feet. His belly which has the blood of the fifth wound can be seen between two crowns. In the Munich codex these are coloured green and black. His feet rest on a strange two headed man without limbs, the left side of his body being green while the right is red. Above the feet of Christ are set two crowns, that on the left being black, while on the right is of a silvery colour. Above Christ's crown, which in the Munich is presented in a circle of gold leaf, is a three headed eagle like bird, here grey but likely to have been silver leaf that has tarnished over the six centuries since its creation. The illustration is entitled 'fforma speculi trinitatis' (the figure of the mirror of the trinity). The text set in a semicircle under the crucified Christ eagle, states that the trunk of Christ must be constituted of calcined copper and that Christ is then transformed by his own power into gold. The mystical suffering of Christ is paralleled with the processes of mortification, calcination and purification. The copper vitriol (his belly) must be distilled seven times "So kill this mercury seven times, always with fresh vitriol, and let it also ascend seven times: God took seven death sentences on his body for us, so that his whole body is dead, bloodied by blows". Although not symbolised in the figure, the text at this point refers to the mystical theme of the two liquids, water and blood, which flow from the heart of Christ. The text beside the two headed figure in the Rylands manuscript, on the right above appears to say "David sobrietas, Dies Saturni" and "Jesse caritas, Dies Lune". Other parts of the emblem, have other of the seven virtues associated with them. We see that is almost impossible to make sense of this image without referring to the text. Sadly, the Buch der heiligen Dreifaltigkeit remains untranslated and few can read its 15th century German.